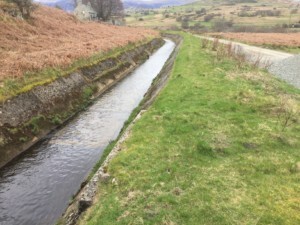 The recent dry spell has come at the right time to help the site team progress the refurbishment of the Ardda Leats for Innogy Renewables UK at Dolgarrog Power Station on the edge of the Snowdonia National Park. The 3 year project is in its 2nd year and is carried out during a series of outages to maintain the power station generation. A Flexcrete product is being installed over a light reinforcement mesh to refurbish 2,500 metres of trapezoidal leats which are approx. 1,100 feet above sea level making the project a logistical challenge.